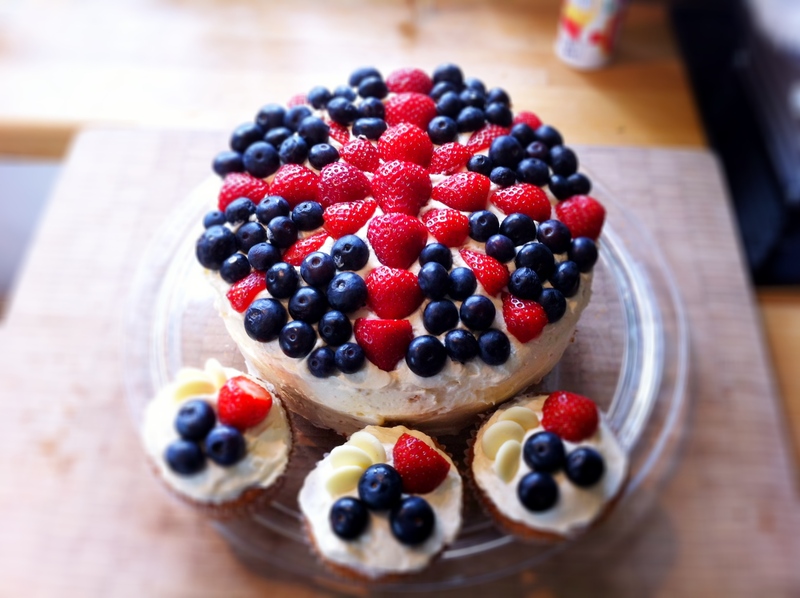 A special celebratory cake for Her Majesty. Preheat your oven to 180 degrees celsius. You’ll also need 3 18cm sandwich cake tins and 5-6 muffin cases and a muffin tray. The amount below enabled me to make a 3 layer vanilla cake and 5 extra large cupcakes. I made a really nice buttercream frosting that I found online – it was divine! The blog I took it from has amazing pictures to show you how it’s made so here’s the link from the Tasty Kitchen if you want to learn to make it. Cream your butter and sugar together until light and fluffy. Gradually add your eggs, one at a team, continuing to beat the mixture. I would ensure at least 30 seconds to 1 minute of beating before you add each egg. Then add your vanilla essence and milk and beat in. Finally, add your self-raising flour and fold in well. Distribute your cake mixture evenly between the tins and put any extra batter into muffin cases. Bake in the oven for 25 minutes or until a skewer comes out clean. Wait until your cakes have cooled completely before decorating with buttercream and fruit. I used a traditional organic strawberry jam between one of my cake layers and then piled raspberries, blueberries and more buttercream on the second layer. I decorated the extra cupcakes with buttercream, milky bar buttons, blueberries and strawberries.